Dubbed ‘City of Dreams’ because of it’s links with Sigmund Freud there is no time more illusory in Vienna than Christmas-time. If, like me, you are an avid fan of Linklater’s film ‘Before Sunrise’ then it’s probable Vienna is already on your bucket list but why not crank up the magic and explore the city at it’s wintry best? 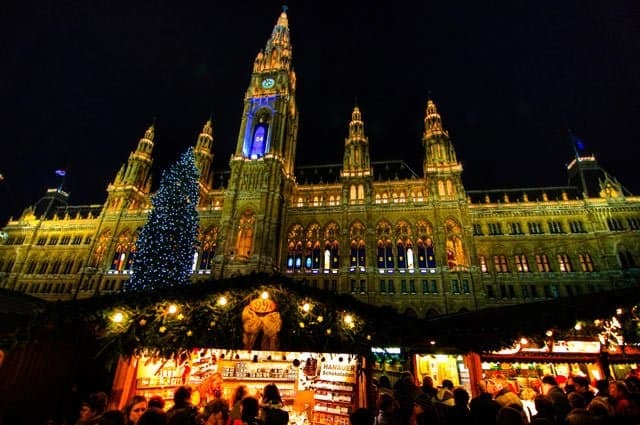 Visit Vienna’s oldest Christmas market at Freyung Wein or buy gifts from local artisans at Karlsplatz. See if you can let go of the railings at the Konzerthaus outdoor ice skating rink or immerse yourself in Vienna’s’ musical heritage at a Christmas Concert in St Anna’s Church. 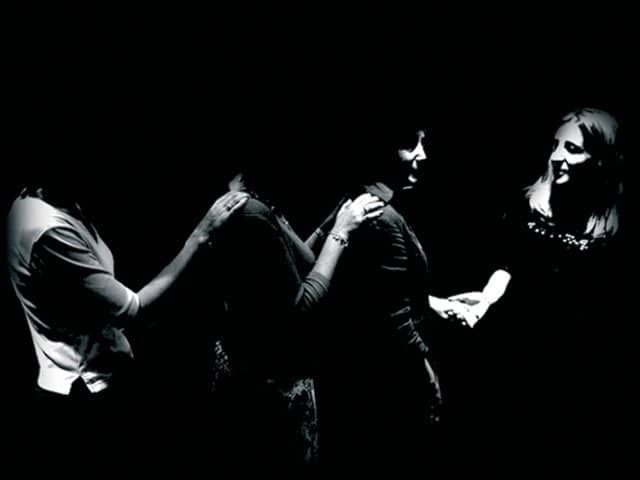 Engage some bohemians at one of the numerous ‘Kaffehaus’ or an underground Viennese folk gig. Marvel at the city’s Baroque and Art Nouveau architecture, get drunk on Gluhwein and dance the night away amongst the magnificent light projections of the Museumquartier. The city that invented the snow-globe is so ripe with romance no mistletoe will be required! Created in the post war period and based on the old Roman road ‘The Romantic Road’ is one of southern Germany’s biggest tourist attractions. The route combines many beautiful historic cities including the fortified medieval town of Rothenburg. ‘The Christmas Town’ has earned it’s name due to its links with Wilhelm Wohlfahrt, owner of the first Christmas shop, and now houses a Christmas Museum and the Kathe Wohlfahrt Christmas Village which are open all year round. 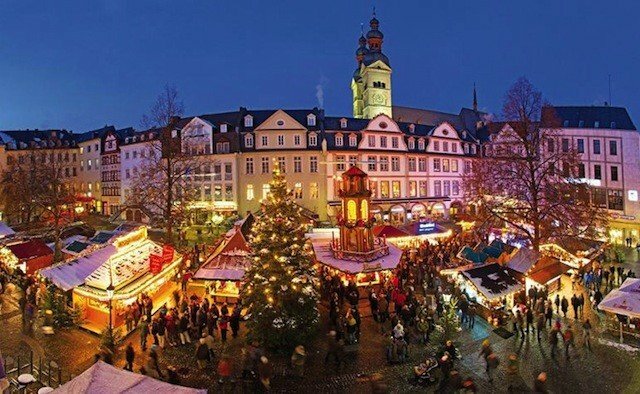 The Advent period also sees the opening of Reiterlesmarkt, a ‘Weinachtsmarkt’ which dates back to the 15th Century and is named after a mythical horseman who visits at Advent time from a parallel world of lost souls. This and the other Christmas Markets on The Romantic Road are steeped in tradition and incomparable to their commercialised counterparts which grace the streets of British cities this time of year. Visit here and stay in a boutique hotel or an ancient inn surrounded by gingerbread architecture straight out of Hansel and Gretel and experience the true nostalgia of a traditional Christmas. 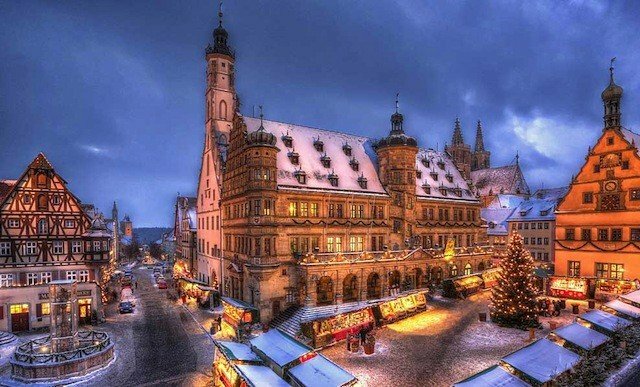 What better place to find your fairytale Christmas than in a city made famous by Hans Christian Anderson, one of the worlds greatest storytellers? 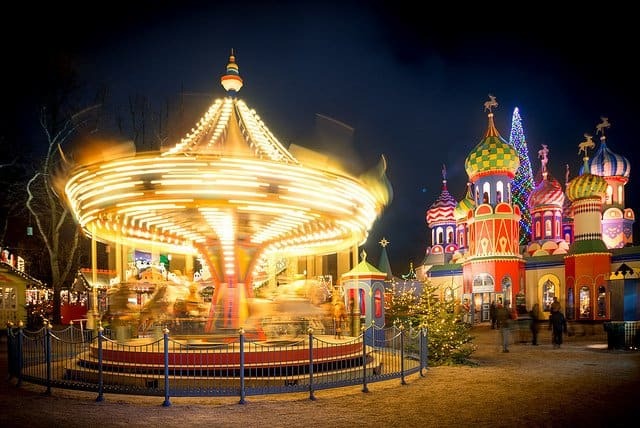 Get enchanted by the cobbled streets and roasted sweet almond scent of Nyhavn, Copenhagen’s ancient canal district, or get a cup of ‘GlØgg’ and explore the festive wonderland at the Tivoli Gardens Christmas Market; With it’s wandering Pixie Band and it’s fantastic illuminations and light shows over the lake this seasonal spectacle will melt the hearts of even the most hardened Christmas critic. 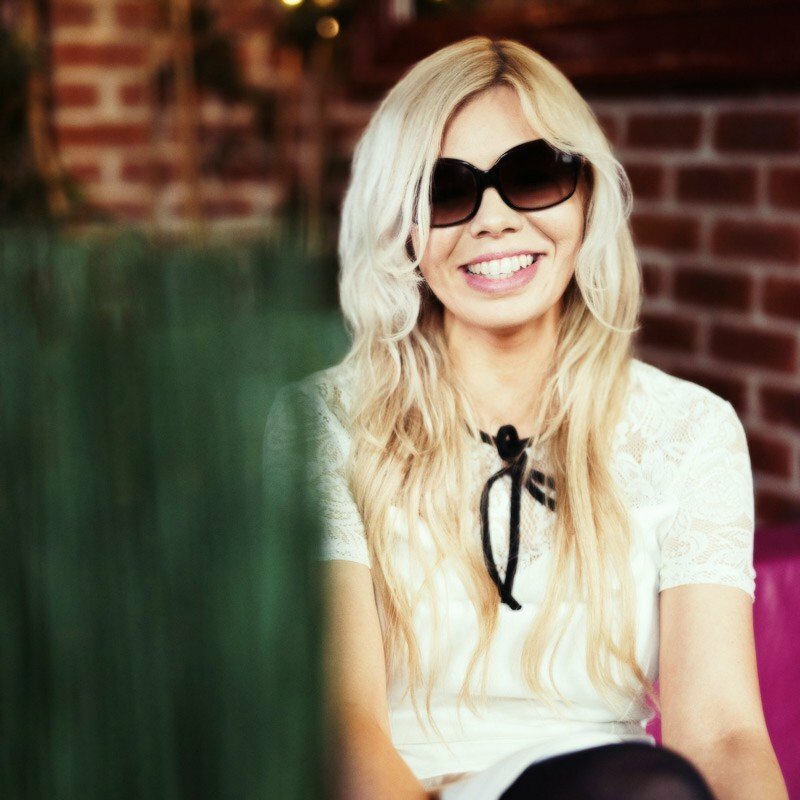 If you find yourself needing a moment away from the fairy lights then you can cosy up in one of the city’s cafes; try a hot chocolate by the log fire in the basement of The Living Room on Larsbiomsstrade or a vintage veggie brunch at Kalaset on Vendersgade. When you’re suitably warmed up head over to the entrance of Fredriksberg Garden and try your skills on the massive outdoor ice rink under the sparkling winter stars. 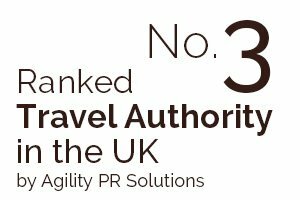 Although it is usually associated with dodgy Santa related package deals and overpriced Christmas tourist traps there are many reasons why Lapland should not be disqualified from our magical Christmas list! 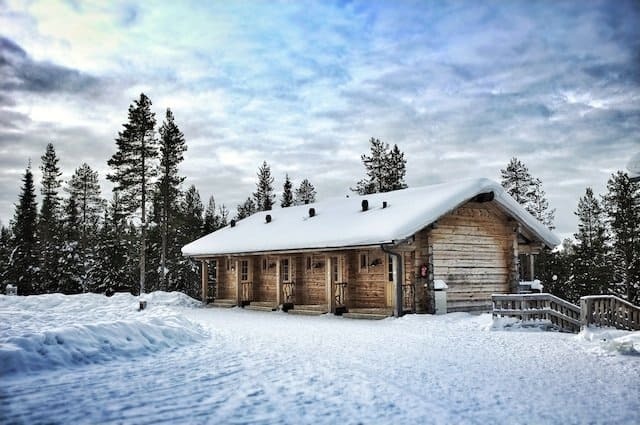 Oulanka National Park on the northern border of Finish Lapland is one of them. Far away from the sweatshop elves it combines the breathtaking landscapes of the North, South and East creating a unique winter wilderness of pine forests, river valleys, sandy banks and rushing rapids. The park is littered with log cabins that are free to use for hikers providing they stick to some simple rules. 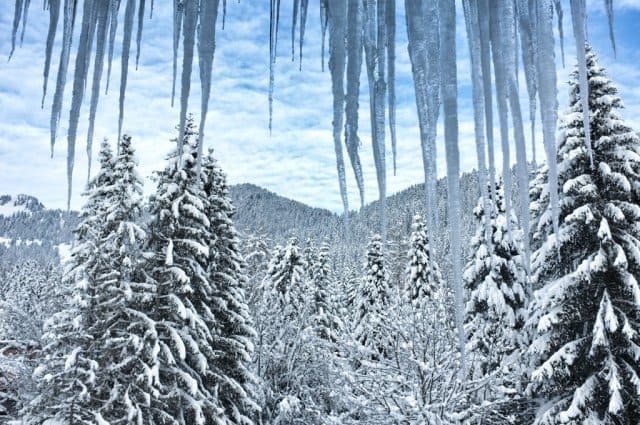 Instead of staying in and laying on the pounds with Christmas treats, here you can get out and hike or ski or take advantage of one of the park’s abundant winter trails such as the Rytisuo Snowshoeing Trail. You can soak up the culture of the Sami, the only indigenous people of Scandinavia and escape the materialism of contemporary Christmas, instead breathing in the unspoilt air and wondering at the beauty of the sun setting early over crisp white snow. 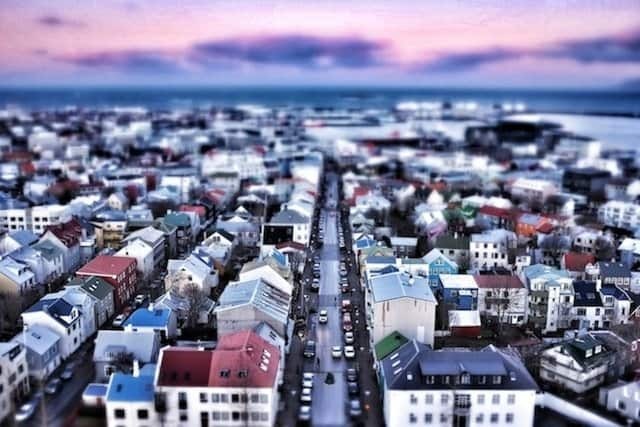 What Reykjavik lacks in size it makes up for in character and here in this very cool city you will find an abundance of Christmas cheer with festivities that focus on peace, harmony and true Icelandic traditions. The snowy city squares come alive with concerts, markets and extravagant illuminations and, according to legend, in the days leading up to Christmas the mischievous mountain ogres venture into the town to cause a bit of mayhem… you may spot one or two loitering in the craft market or hanging from the fairy lights. You can eat until you pop at Jalakras Street Food Christmas Market where the city’s finest restaurateurs collaborate to create fine dining Christmas themed street food or visit Yule Town in Ingolfstorg Square. All this amidst the clean white lines of Icelandic architecture, under a sky aflame with the intense colours of The Northern Lights, this surely must be Christmas heaven? 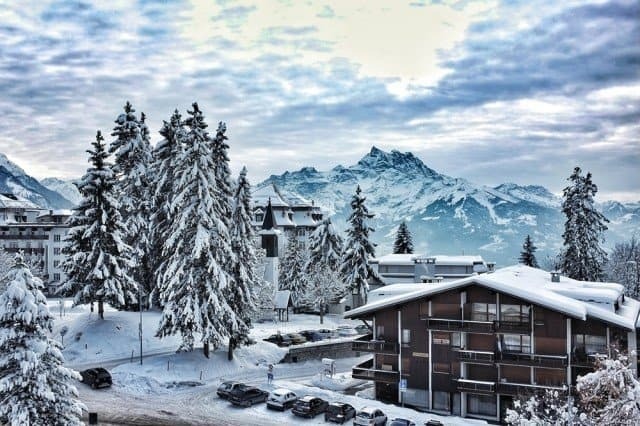 For winter sports enthusiasts the village of Villars in the Swiss Alps is a Yuletide dream come true. A short trip from Geneva airport it has around 270km of pistes and a snow park for those who prefer to ski and snowboard ‘freestyle’, as well as numerous other ski related activities such as ski touring and night skiing! However there is more to a Villars Christmas than the slopes! Stay in one of the self catering chalet’s or fine hotels and enjoy breathtaking views of the Rhone Valley and Mont Blanc whilst getting involved in the local festivities. At The Abbaye de Salez Christmas Market you can enjoy a gastronomical experience of wine and food to get your taste buds popping, or perhaps afternoon tea with Father Christmas is more your bag? In Gryon you can live this dream and also take in the large scale Advent Calender which sees a new decoration being lit up every evening on the quaint village streets. Whether you are a beginner, an accomplished skier or just a spectator,Villars is a magical winter wonderland of Christmas cheer. During November and December the stunning medieval architecture, quaint parks and impressive squares and plazas of Bruges are transformed into a magical wintry wonderland for the senses. The cobbled streets are illuminated with Christmas lanterns and picturesque Christmas markets fill all available spaces. The Snow and Ice Sculpture Festival puts Edward Scissorhands to shame and the outdoor ice rink by Grote Markt glitters like stardust under the festive lights. The dressed up chocolate box city is like a childhood dream of Christmas and you can get there in just 3½ hours by Eurostar. With plenty of accommodation options the meandering little streets and canals of Bruges are the perfect setting for a romantic Christmas break with a loved one. 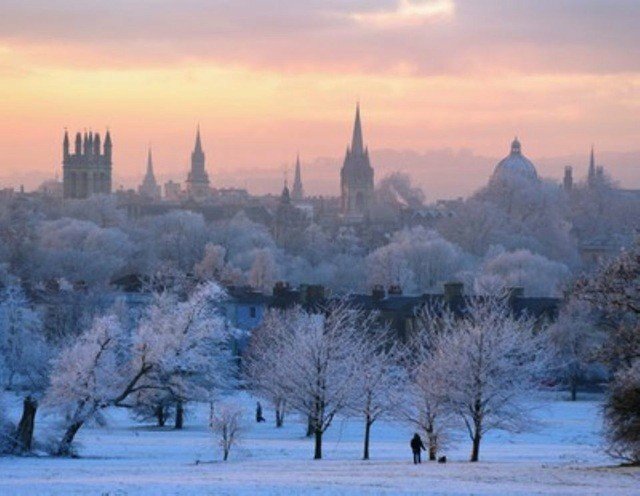 If you are tired of the strain of Christmas planning why not treat yourself to a Christmas break in the Cotswold’s where most of the hotels go to town to create a unique Christmas experience for their guests. Indulge in an alcohol fuelled respite in front of the roaring log fire at The Snooty Fox in Tetbury or cream tea, carols and midnight mince pies at The Millhouse Hotel in Kingham. Perhaps like us you prefer to explore places independently, in which case this area of outstanding natural beauty holds many festive treasures! The avid Advent adventurer can find an array of quintessentially British events such as ‘Carols in the Barn’ at Winterbourne and numerous quaint Christmas fête’s or midnight masses in exquisite 11th Century Churches. To notch up the magic the Cotswold’s also host some world famous international Christmas Markets and Westonbrit’s spellbinding Enchanted Christmas Trail illuminates all the trees in the village. Even the weather can’t dampen the Christmas spirit in such idyllic and timeless rural surroundings. The Emerald Isle has many a castle hotel nestled in its rolling hills and wild windy landscapes and most will offer a Christmas package. On the west coast you can live like landed gentry at the exclusive Dromoland Castle Hotel in Co. Clare ‘8 miles from the airport and a million miles from anywhere’. 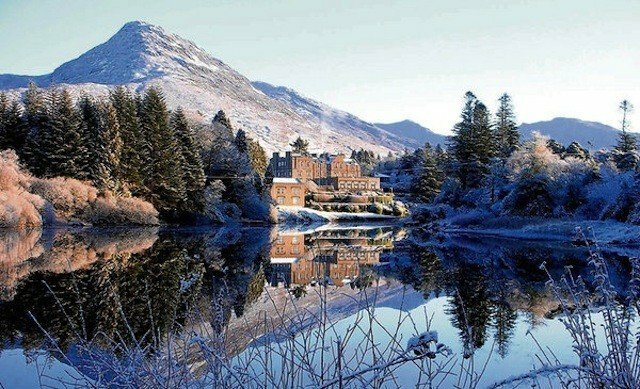 Dromoland is a rarity as it can be traced back to native Celtic Irish royalty, It’s ancient walls now embody a perfect blend of old world charm and modern amenities with views of the 16th Century courtyard or the shimmering lake. In Co. Cork you can stay in the beautiful Lismere Castle, built by King John in 1185 this historical gem has Jacobean defensive walls which are believed to be the oldest remaining in Ireland. Set amidst rich green valleys the period rooms and banqueting halls maintain much of their original character and the gourmet chef serves up delicious locally sourced food using many home produced ingredients. Guests can enjoy meandering through ancient woodlands dotted with sculptures or luxuriating in be-legged bath tubs like queens. It may not be a snowy wilderness like Scandinavia but Ireland has beauty and Christmas magic in swathes. 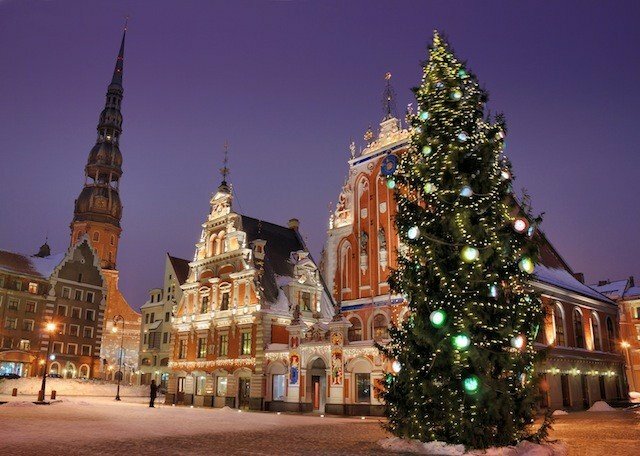 Riga has to make it on to the magical Christmas list as it is said to be where the tradition of decorating the tree was born! In the 15th Century Pastor Balthaser Russow wrote of an established custom whereby the young men of Riga accompanied by ‘a flock of maidens and women’ brought a decorated spruce into the town square and then set the tree aflame as they danced and sang around it. Now the beautiful old town of Riga houses a wonderful Christmas Fair which sells a wide range of Latvian handicrafts and local food and delicacies. The already beautiful streets of the city take on a magical glow and the scent of roasted sugar almonds hangs in the air. 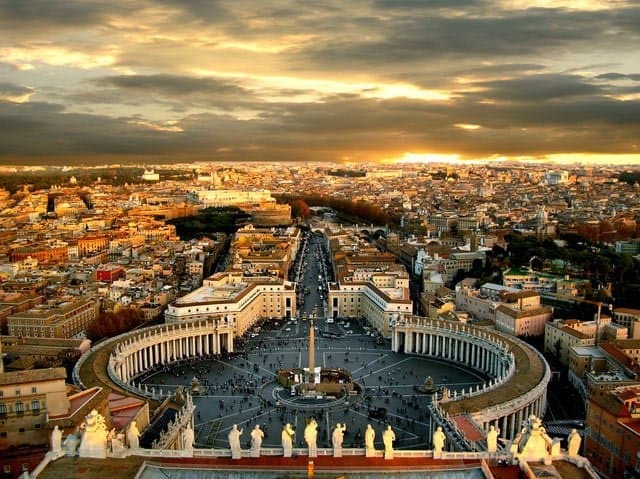 This underrated rival to Budapest and Prague is one of the gems of Eastern Europe and well worth a visit, the elegant spires and glorious Art Nouveau architecture provide the perfect frame for a magnificent Christmas adventure. We hope this list of Yuletide jewels has inspired you, and wherever you may roam as 2015 dwindles and 2016 awaits, we at Global Grasshopper wish you a very merry Christmas and a happy new year! And here I am thinking Christmas in Seattle is pretty great. It’s not even a white Christmas here!!! Absolutely fantastic posting! 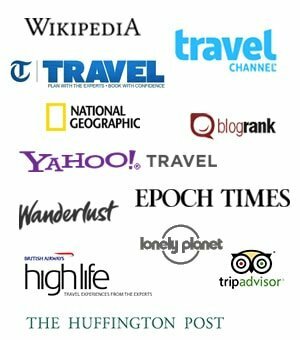 !Good compilation of details about places to visit Christmas destnations. All seems worth visiting. Thanks for sharing such an informative content. Lovely list! I would also add Prague to it! We were just in Copenhagen, and I completely agree with that choice. Thanks for sharing! 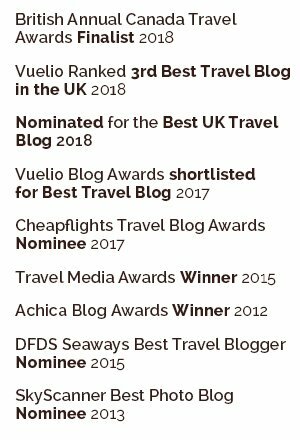 Some interesting choices here – Finnish Lapland would be top of my list. Winchester and Bath are also two stunning UK destinations for Christmas markets. You hve some really magical Christmas places on the list, Beth! Ha, I did a similar list and I’m happy to see that we agree on a few of these. But it’s also fascinating to see the cities you chose that didn’t make my list — really make me reconsider and want to try a holiday season in those cities. 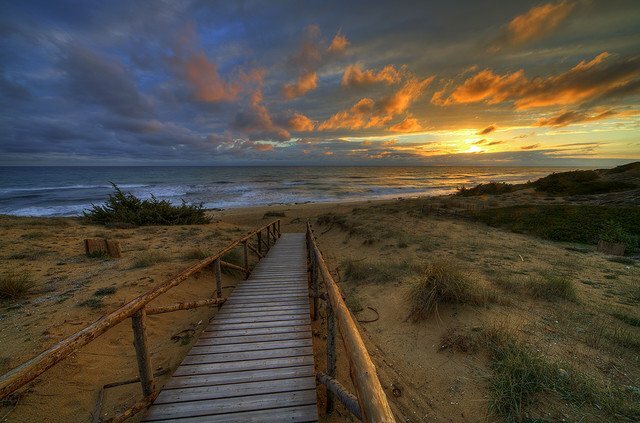 Can’t wait to see what you come up with for the next holiday! Winter is really a great time for Europe! Especially Rothenburg Ob Der Tauber. Great post! I’m glad that you included the Cotswolds, they are so beautiful at this time of year! Great post and pictures they all do look really magical!